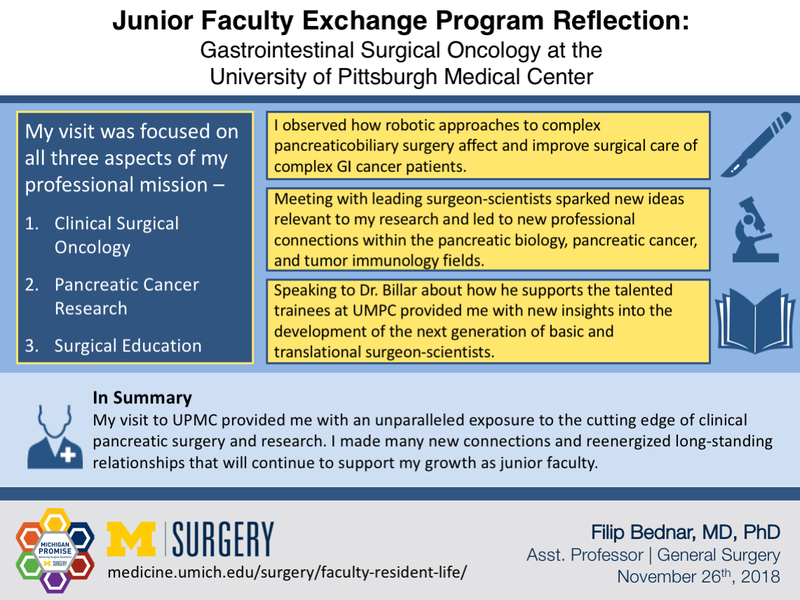 Dr. Bednar reflects on his time at the University of Pittsburgh as a participant in the Junior Faculty Exchange Program. As part of this initiative, I had the privilege to travel to the University of Pittsburgh to visit the UPMC Pancreatic Cancer Treatment program. My visit to Pittsburgh was organized under the auspices of the Division of Gastrointestinal Surgical Oncology and was focused on all three aspects of my professional mission – clinical surgical oncology, pancreatic cancer research, and surgical education. The program at the University of Pittsburgh leads in the use of new technologies in clinical surgical care. During the visit, I observed how robotic approaches to complex pancreaticobiliary surgery affect and improve surgical care of complex gastrointestinal cancer patients. We are actively developing a similar program at the VA Ann Arbor Health System to provide access to this advanced technology and its clinical benefit for our veterans. Pancreatic cancer research is a key part of the academic mission within both Departments of Surgery. During my visit, I met with leading surgeon-scientists in the field of tumor immunotherapy including Dr. Michael Lotze and Dr. Udai Kammula. Although the use of immunotherapy in pancreatic cancer has so far not been successful, work at both institutions is making significant strides in understanding why this is the case. Pittsburgh also has a vibrant core of researchers studying pancreatic development and healing, processes that help us understand how pancreas transforms in cancer. I met with Dr. Sohail Hussain and Dr. Farzad Esni to discuss the epigenetic regulation in this context, which is the primary focus of my current work. These meetings sparked new ideas relevant to my research and led to new professional connections within the pancreatic biology, pancreatic cancer, and tumor immunology fields. I had one of the most enlightening conversations of the visit with Dr. Timothy Billiar, the George Vance Foster Professor and Chair of the Department of Surgery, when we discussed the training of the next generation of basic and translational surgeon-scientists. Dr. Billiar’s extensive experience as a practicing surgeon-scientist in the field of cellular and organ injury in shock, trauma, and sepsis has allowed him to create a highly engaging environment for the surgical residents at Pittsburgh. How he supports this talented group of trainees provided me with new insights into the development of the next generation of basic and translational surgeon-scientists. The current clinical practice and scientific funding environment will require creative approaches to train surgeons as scientific leaders. My visit to the University of Pittsburgh provided me with an unparalleled exposure to the cutting edge of clinical pancreatic surgery and research. I made many new connections and reenergized long-standing relationships that will continue to support my growth as junior faculty. The Junior Faculty Exchange is an outstanding initiative that will form one of the cornerstones of my developing career.  Reach out to join the conversation or to learn more about how to implement the Michigan Promise. Connect with the Department of Surgery or our faculty on Twitter to share your ideas or get in touch with the Office of Faculty & Resident Life to schedule a Michigan Promise presentation at your institution. 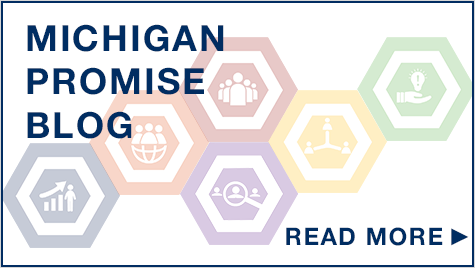 You can also fill out our Michigan Promise Inquiry Form with any questions or comments.